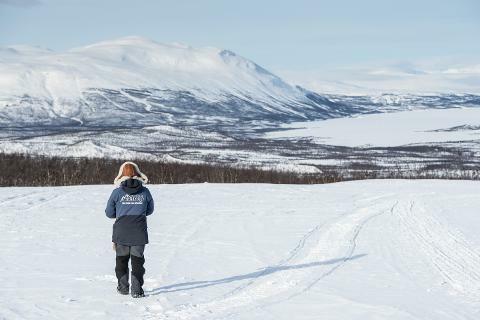 During this adventure through the mountain areas around Abisko National Park you will sit comfortably in a sled driven by one of our snowmobile guides. The area is home to a number of wild animals, for instance moose, reindeer, wolverine and ptarmigan. Their prints can often be seen in the snow and it is not unusual to encounter some of these animals in person. Our guides are well acquainted with the area and will be happy to tell you about life in the Arctic. You will be taken through a beautiful frozen landscape and after a while elevation will gradually start to increase. When weather conditions are good, you will soon be able to overlook the Abisko area, Lake Torneträsk and the mountains beyond. Before making our way back home we will stop for a break and make a fire where you will be able to enjoy a hot beverage together with the magnificent views. Starting time is 09:30 and return is at 11:30. Warm clothing and hot beverages are included. Please be at our starting point 15 minutes before the scheduled starting time. If you wish to join this trip on another date than those scheduled, please send an email with your request to activities@abisko.me.